When planning your honeymoon and trying to create the trip of a lifetime, it can be difficult to narrow down the destinations. Below you’ll find some of our green honeymoon specials designed to create a truly once in a lifetime experience for you and your spouse. Venture off the beaten path in Northern Tanzania to Mahale Mountains National Park, where you’ll find the incredible safari camp Greystoke Mahale. Located on the eastern shores of Lake Tanganyika, Greystoke Mahale offers a beautiful view of the Mahale Mountains, which is home to around 1, 000 chimpanzees. One of the highlights of the stay is tracking the chimpanzees through the forest and observing these incredible creatures in their natural habitat. Other species found in the forest include eight other primates, birds, and butterflies. Take a dip in one of the many waterfalls during a hike in the forest. The crystal clear waters of Lake Tanganyika are also an ideal place for swimming, as well as snorkeling, fishing, and kayaking. 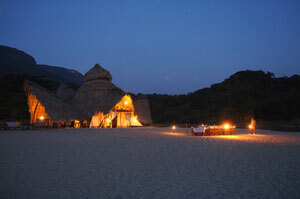 Greystoke Mahale consists of 6 open front wooden and thatch bandas tucked into the forest. The bandas have en-suite bathroom with hot showers and flush toilets, a dressing room, and an upstairs deck. End the day with a private beach dinner, stunning scenery from the upstairs viewing decks, or relax with a drink at the bar. Your stay at Greystoke Mahale will be unlike any other Tanzania safari experience! If you’re looking for the adventure of a lifetime, Argentina and Chile should be at the top of your travel list. Begin your honeymoon relaxing at an eco lodge in the trendy Palermo Soho district of Buenos Aires. After enjoying the local cuisine and wines, head to Torres del Paine National Park in Chilean Patagonia. 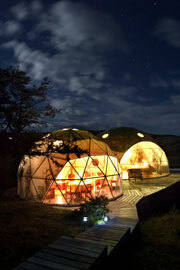 Combine luxury and sustainability at the Ecocamp suite domes. Located in Patagonia, the Ecocamp suite domes offer a unique accommodation option, combining the comforts of a hotel with the sustainability achieved by camping. You can easily stand up and sleep in a real bed in these dome-shaped tents. The intention of the design of the Ecocamp was to remain in close contact with nature, much like the ancient inhabitants of Patagonia did. The Ecocamp Patagonia has received the prestigious ISO14001 Environmental Management System certification and must continue to improve its sustainability initiatives to maintain certification. The ecomcamp offers a variety of activities. If you’re up for the challenge try the Torres del Paine circuit trek. There are also shorter and easier routes offered that still venture to beautiful locations in the park. Nature tours are also offered to see the unique flora and fauna of the area. Another option is to explore the park by horseback, which allows you to venture to more remote locations. A Galapagos Island tours are the ideal honeymoon adventure, combining nature, wildlife, relaxation, and a plethora of activities to choose from. Now, you can experience the Galapagos in a whole new way at the Galapagos Safari Camp. The camp is the first eco-luxury tented camp in Ecuador, allowing guests to enjoy comfort in their tents while experiencing closeness with nature. Whether you want to enjoy a brief stay at the camp, or combine your visit with a cruise, the Safari Camp offers a different way to explore the nature and beauty of the Galapagos. It is located in the highlands of Santa Cruz Island and overlooks the National Park, with views of the ocean and the western and northern islands. The tortoise reserve is nearby, and the surrounding area is home to many bird species, including finches, warblers, mockingbirds, and owls. The central lodge has an open design and includes a lounge with a fireplace, a bar, and a dining room that offers local and international cuisine. 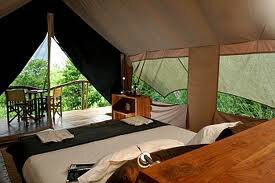 The nine tents comprising Galapagos Safari camp are located below the central lodge. The tents are spacious, fully furnished, and have en-suite bathrooms with hot showers and flushing toilets. All of the tents also have a balcony with views of the park and ocean. An infinity pools enables guests to observe the surrounding nature while escaping the heat. Activities offered include walking tours, cycling, horse trekking, and bird watching. Head to the lowlands of Santa Cruz Island to swim in the turquoise water or walk along the white sand beaches. Spend a day snorkeling, diving, kayaking, or surfing. The main town of Santa Cruz, Puerto Ayora, has many dining options, shopping, and galleries to peruse. Snorkeling or diving at nearby islands can also be arranged. New help planning your green honeymoon? Fill out a custom tour form or give us a call at (866) 577-2462!